When it comes to incidents where rapid, reliable communication is essential, wildfires top the list. Often fast moving and highly unpredictable, these natural disasters can turn on a dime and suddenly threaten people and structures that moments before seemed to be out of harm’s way. Being able to receive and analyze data quickly so resources can be positioned as needed to address new threats is critical. That’s why every incident management team should have portable satellite systems at their disposal. Full mobility. The Star-Runner™ can be transported to an incident command post by any vehicle with a Class 3+ hitch and 2” receiver. The system travels suspended on the hitch, so there are none of the issues associated with pulling a trailer, such as insurance, registration, etc. Ease of deployment. Despite the fact that a Star-Runner™ typically contains the most advanced communications equipment available, the portable satellite system is easy to set up and get a team online. Intelligent connections. The Star-Runner™ systems automatically seek high speed cellular connections first. If none are available, they fall-over to high speed satellite backhaul until a cellular connection is established. This ensures maximal data flow at the lowest possible cost. Comprehensive data transmission options. The Star-Runner™ can support POTS (plain old telephone service) lines, VoIP, fax, wireless phone, wired Ethernet, and Wi-Fi cloud connection. Universal carrier support. The system supports all commercial carrier bands, as well as Band 14, the national public safety wireless network for first responders, FirstNet. Successfully protecting citizens, property, and first responders during a wildfire can be extremely challenging. But having a powerful, intuitive, and highly portable satellite system can be a lifesaver. 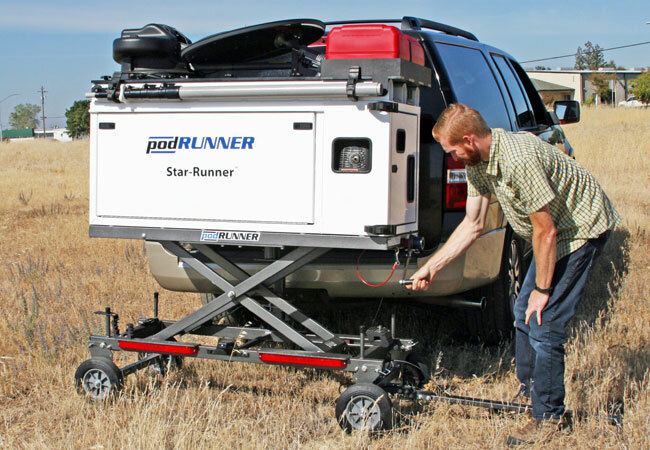 Find out how the Star-Runner™ can make your job easier by calling us at (888) 427-3728 or emailing info@ThePodRunner.com.